Scr: Chookiat Sakweerakul; Art Dir: Thanakorn Boonlue; Ph (color): Chitti Urnorakankit; Ed: Chookiat Sakweerakul and Lee Chatametheekul; Prod: Prachya Pinklaew, Sukanya Wongsthapat. Cast: Sinjai Plengpanich, Chermal Boonyasak, Songsit Roongnophakunsri, Mario Maurer, Witwisit Hiranyawongkul. When The Love of Siam was released in the domestic market last November, a sensation had spreaded among the teen groups, through the massive hits on websites and webboards. A few months later, the 3-hour-long direct-cut was shown, breaking all records in the city arthouse theatre. People came to book advance tickets several hours before the office hours. In a few days, tickets had been sold out in for over a two-month period. Initially, The Love of Siam seemed to be a pop-culture flick that should be hit only among young audiences, especially with the rise of two young stars Mario Maurer and Witwisit Hiranyawongkul. But what does it mean when this movie swept all of the local best film awards, as well as the majority takings of best director, best actress, and best script? A subtle family-drama and homosexuality-in-transition paradigm, The Love of Siam is engulfed with these two themes in parallel. Tong, an eighteensomething boy, accidentally meets his childhood friend Mew who also sets up a music band named August on the street one day. The two boys start to reunite their friendship, this time in different ways from the early days. They hang out together, sleeping on the same bed, chatting, hugging each other and sharing their problems. Tong lives with his shattered family after they lose their first daughter without any further trace. Tong’s mother has to take responsibilities in all of the family matters since then, as the father turns to use alcoholics to cure his pains. He accuses himself as the cause of his daughter’s disappearance. Mew introduces June, his manager, to Tong’s family. She incredibly looks similar to the lost daughter. Everything seems fine. But one night, the mother sees Tong kissing Mew….. The Love of Siam is in general embroidered in a quiet realm of emotional minimalism as much as possible. Expressions are kept low, reserved in extent, in order to keep the film in a mode of everyday-going resemblances, like a story which can happen to any Thai middleclass families. And director Chookiat did it quite well in this craftmanship. (He is also the director of the thriller 13 Beloved. Remember, a guy is asked to eat chit in his participation for a lucky draw game). All characters made very well in their performances, despite several acting debuts. However, this minimum method attempt comes out with a bit too stark, unnatual performances in some parts, even by the two veteran performers who play the parents. The film sometimes moves with a slow rhythm. Several nice camera shots are taken. Worthy mention to music and songs – nostalgic, sweet but painful. Several of them were also composed by the director himself. Surprisingly, after watching the film, my mind still can not be distanciated from the scenes, the sequences, the songs, the pain, and especially the fantastic ending. I realized - The Love of Siam is a kind of films that will not automatically switch on with crazy responses but something to be lingering in your hearts forever. Director Chookiat proves to the world that he can be a master in all kinds of movie genres and that he’s one to be mostly watched out in the next following years. 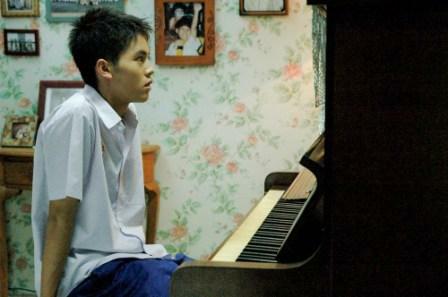 Chookiat Sakweerakul was born in 1981 and finished his first degree in filmmaking from Chulalongkorn University. He started from making several shorts before spending his own money to make an independent feature Lee (2001) – one of the first indie projects that were screened in commercial theatres. He entered to work with the studio Sahamongkol Film since 2004, which came out the horror Pisaj (aka Evil), and 13 Beloved. Love of Siam is his third feature.